Parkinson’s Disease Causes: What Causes Parkinson’s Disease? After diagnosing a patient with Parkinson’s disease, a common, challenging question physicians have to answer is, “Why did this happen to me?” Answering this question is a challenge because the the causes of Parkinson’s disease are complex and not well understood. What causes Parkinson‘s disease? has been investigated since 1817, when James Parkinson published his monograph “An essay on the Shaking Palsy”. For more than a century, scientist only managed to describe the changes in the body that lead to the clinical signs and symptoms of Parkinson’s disease. Nevertheless, these research findings have been the basis for our current knowledge of Parkinson‘s disease causes. As research revealed microscopic changes with Parkinson’s disease, theories and models of the causes were made. Through our understanding of these changes, several underlying causes have been proposed. In order to understand what causes Parkinson‘s disease, it’s important to first consider the microscopic changes that occur with this disease. In Parkinson’s disease, there is a progressive and irreversible process of degeneration in the nervous tissue. This process is mainly found in an area of the brain called the substantia nigra, which is a small portion of a bundle of nerve cells called the basal ganglia. However, changes can also be found in other areas of the brain and body, including the olfactory bulb, raphe nuclei, dorsal nucleus of the vagus nerve, and cortical areas. Intracellular protein inclusions (three proteins, alpha-synuclein, ubiquitin, and alpha B crystalline) are also important to consider, which are associated with the three pathogenic mechanisms in Parkinson’s disease. So what causes these changes that ultimately result in Parkinson’s disease? The three fundamental causes are mitochondrial dysfunction, alterations of ubiquitin-proteasome system, and phosphorylation variations. Perhaps there are other pathogenic mechanisms, but these are currently the best-understood and they provide a relatively complete explanation for the process of developing Parkinson’s disease. It is important to note that these mechanisms are not the cause of the disease, but rather the way in which the neural tissue is injured. Also, it is import to remember the concept of homeostasis and how it relates to disease. Cells are in constant interaction with their surroundings and for this reason, they need to adapt to them. If they are not able to, they will be injured. Cells are equipped with mechanisms to adapt to their surroundings. If these mechanisms are successful they are able to maintain homeostasis. However, like in Parkinson’s disease, these mechanisms can be inactivated or unable to keep up. As consequence, there the cells are injured and can eventually die off. One of the basic mechanisms is mitochondrial dysfunction. Mitochondria are an important part of the cell because they supply the cell with energy. If the mitochondria fail or become injured, the cell can no longer live. Mitochondrial dysfunction is typically mediated by increased reactive oxygen species and reduced activity of the electron transport chain (resulting in deficient energy production). The result of this leads to general cell malfunctioning. Deficient energy production can result in alteration of any physiological mechanism in the cell that requires the use of ATP or alternate energy-providing molecules. ATP-dependent mechanism varies from active transport in diverse cellular membranes to the activation of diverse signaling proteins. Reactive oxygen species can also be very harmful to the cell. Due to their chemical instability, reactive oxygen species can interact with almost any molecule in the cell. These interactions can result in mutations in the genetic material, degradation of lipids from the phospholipid bilayer (from which more reactive oxygen species are created) and, of great importance, in Parkinson’s disease protein structural changes. These protein structural changes, along with deficient energy production, link mitochondrial dysfunction to another pathogenic mechanism, alterations of the ubiquitin-proteasome system. The alterations of the ubiquitin-proteasome systems is responsible for the degradation of altered proteins. This happens through the addition of the ubiquitin peptides in proteins that signal the proteasome to eliminate proteins. This is an essential process in cells because protein alterations can accumulate and cause further injury. In Parkinson’s disease, this is of great importance because one of the essential histopathological findings are intracellular protein accumulations. However, it is not known if protein accumulation is just a result of the degenerative process or an active mechanism of neuronal toxicity that causes neuronal degeneration. Most evidence points to the latter; protein accumulation is an active mechanism of neuronal toxicity. First of all, protein accumulation could be a site the generation of more altered molecular components, which in turn creates more molecular alterations. Additionally, the accumulation of proteins can cause direct lesions to the integrity of the plams membrane, resulting in leakage of essential components and introduction of harmful substances. Finally, these intracellular accumulations could interrupt essential proteins, such as the phosphorylation enzymes involved in the third pathogenic mechanism of cellular injury. The process of phosphorylation is essential in cellular function, particularly in signaling process. Phosphorylation or dephosphorylating have a diverse effects, like the activation or deactivation of proteins. In Parkinson’s disease, variations in the phosphorylation process is one of the key pathogenic processes, in particular, kinase signaling process related to cell death. It has been theorized that there could be an activation of cellular death mechanism mediated through the mitogen-activating protein kinases and/or the phosphatidylinositol 3-kinases signaling pathways. It is also important to recognize the interaction of the other mechanism with phosphorylation variations in the cells. The phosphorylation process affecting cell death could also be affected my mitochondrial function. It is widely known that mitochondrial dysfunction has a direct association with cellular death through several molecules like the caspases and the BCL proteins. Also, it has been observed that several of the proteins found in intracellular accumulations, in Parkinson’s disease, are often hyperphosphorylated. The mechanisms are the way in which the causes of Parkinson’s Disease create intracellular accumulations and neuronal cell death. A group of these causes are genetic alterations, which include the following genes SNCA, PARK, UCH-L1, DJ-1, PINK1, and LRRK2. All of these can cause neurodegeneration through any of the three pathogenic mechanisms. It is important to note that these mutations are not always an exclusive cause of Parkinson’s Disease and sometimes can be associated with other neurodegenerative diseases. SNCA codes for one of the most important proteins involved in the pathogenicity of Parkinson’s syndrome. Regardless, that a patient doesn’t have a mutation in the SNCA gene, almost all causes of Parkinson’s Disease will interact with its product, alpha-synuclein. Alpha-synuclein is thought to have a function in intracellular trafficking of neurotransmitter, nevertheless, more research needs to be performed in other to prove this. The mutations of this gene include three types of point mutation (A53T, A30P, and E46K), and in rare cases gene duplications or triplications. 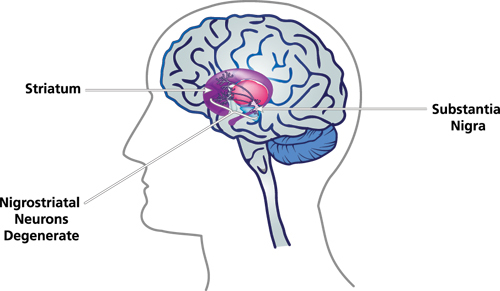 The A53T and E46K mutations cause Parkinson’s disease with atypical features as such early onset of the disease or unusual psychiatric manifestations. The alfa-synuclein protein is particularly important because it is the most common type of protein found accumulated in the neuronal cells of patients with Parkinson’s disease. As it was said before, alfa-synuclein tends to be hyperphosphorylated and found in protein structures called protofibrils and fibrils. Another genetic alteration is found in the gene PARK which codes for the parkin protein. Parkin is an enzymatic protein involved in the ubiquitin-proteosome system. The mutations in PARK gene results in cells being unable to degrade proteins and the process of protein accumulations begin. UCH-L1 is gene that codes for another protein involved in protein degradation, ubiquitin carboxylase-terminal hydrolase L1. Its malfunction also results in protein intracellular accumulation. The DJ-1 gene codes for a protein with unknown functions but it is theorized it is involved with mitochondrial function as an antioxidant, a reduction-oxidative sensor, a chaperon or protease. Studies have shown that in animal models, defects in this genes create oxidative stress sensitivity. Genetic diseases also use the phosphorylation mechanism to create dysfunction. This is seen through the mutations in the LRRK2 and the PINK1 genes. The LRRK2 gene codes for a protein that sometimes is called dardarin. Dardarin’s functions are not currently understood but they are thought to be involved with phosphorylation and tends to be found in mitochondria. Also, it has been observed that dardarin sometimes interacts with parkin. Finally, the PINK1 gene codes for PTEN-induced putative kinase-1. It is known that this protein is a mitochondrial kinase, however,the substrates are unknown. It has been observed that mutations in this protein result in mitochondrial dysfunction and accumulation of reactive oxygen species. The reactive oxygen species can result in mitochondrial DNA mutations and alteration of protein structures. One of the proteins altered is complex 1, which will be affected by certain neurotoxic causes of Parkinson’s disease. This will lead to further production of reactive oxygen species, intracellular protein accumulations, and cellular death signals. Apart from the genetic causes of Parkinson’s disease, there are neurotoxic causes which mainly involve the mitochondrial dysfunction. (Once again, if the neurotoxic agents are the only cause of the symptoms this excludes the diagnosis of Parkinson’s disease. Parkinson’s disease is characterized by being a multifactorial illness.) These chemical agents include paraquat, 1-methyl-1-phenyl-1,2,3,6-tetrahidropiridine, and rotenone. Paraquat the organophosphate group of chemical causes of Parkinson’s disease. Paraquat and its related chemicals cannot pass the brain-blood barrier, therefore it is theorized that its effects are the result of the creation of reactive oxygen species outside the nervous systems. In the other hand rotenone and 1-methyl-1-phenyl-1,2,3,6-tetrahidropiridine can cross the blood brain barrier and cause effects directly in the nerves cells. They also do this by creating reactive oxygen species but also they interact with the complex 1 of the electron transport chain. Meaning that apart from the lesions caused by the reactive oxygen species, they also cause deficient energy production. Additionally, 1-methyl-1-phenyl-1,2,3,6-tetrahidropiridine interacts with BCL and caspases proteins. As previously stated these are mitochondrial proteins involved with the cell death signaling process originating from mitochondria’s. Finally, there are theories about the chemical instability of dopamine. Perhaps due to this instability they can create reactive oxygen species and/or have intrinsic neurotoxic characteristics that result in neuronal lesions. This might also explain why dopaminergic cells, in particular, are susceptible to neurodegeneration. The other two causes of Parkinson’s are actually considered risk factors by many because their pathogenic mechanisms have not been deciphered. Nevertheless, the association with Parkinson’s disease is hard to miss. This reminds us that there is a great of need for research in this disease. Even with only our current understanding of the causes of Parkinson’s disease, several therapeutical options are being developed. Many which are oriented to stop the pathogenic mechanism in Parkinson’s disease. 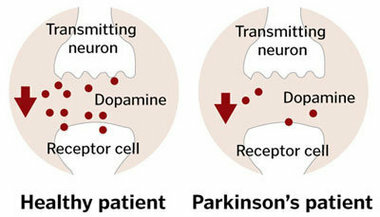 Others seek to inhibit the causes of Parkinson’s disease from using the pathogenic mechanism and causing cell damage. Only through a greater understanding of the disease will scientist be successful in developing these technologies.